Last week in DC I found the iconic symbol for my recent dark side / light side discussion on reasons for choosing either cyber offense or cyber defense — at a Barnes & Noble bookstore. 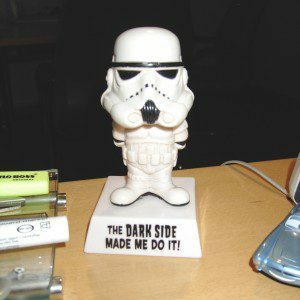 The little imperial stormtrooper is now standing on my untidy desk in my Hamburg office. The deeper wisdom is something like this. For offensive cyber activities there is a business case. You can make something happen for a competitive price. For passive defense there is not. You will perhaps prevent something that might not happen in the first place. Looking at it in terms of economics, offense has a clear advantage – at least in the short term. Therefore it should not surprise that substantial amounts of money are funneled to offensive cyber programs, and neither should it surprise that enough cyber foot soldiers are eager to grab that money. The few renegades over at the light side of the force justify pursuing their ill-funded low-budget act by citing Yoda’s traditional saying, protecting yourself not profitable is. The right thing to do it is.